Choose from two different rooms at this classic Hotel, enjoy a complimentary dinner on the first night, and afternoon tea for stays of two nights! One of the UK’s liveliest cities and is renowned for its exciting, vibrant nightlife, quirky shops, cosmopolitan outlook and contemporary architecture. There is rarely a dull moment in Brighton, from the excellent shopping possibilities to the bustling café bars and restaurants or indulge in seaside fun of Brighton Pier. The Lanes is a myriad of narrow streets directly behind the hotel offering a wide range of specialist shops including jewellery, designer clothes and crafts. 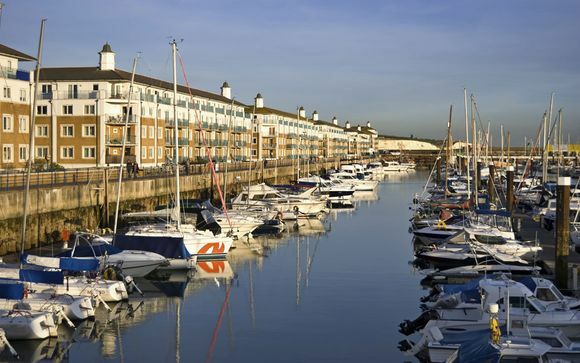 The Brighton Marina is home to an outlet village, entertainment centre and some of the UK’s finest yachts and boats. Discover this amazing 4 star seafront hotel dating back to 17th century. 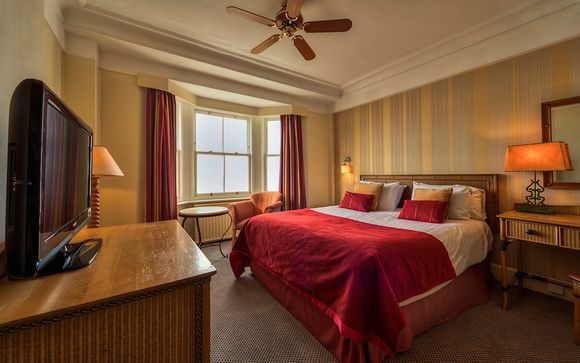 Having hosted guests such as Charles II & Paganini, this historic Georgian seaside hotel is located a stone’s throw from Brighton’s main attractions. You'll love the location, as well as the hotel's fantastic facilities - especially the hotel restaurant. This offer is based on a King or a Standard Sea View Room. Just for you: Late check out until 1pm. Recently refurbished with a contemporary design, these rooms are certain to brighten up your day with their classic decor and excellent facilities. 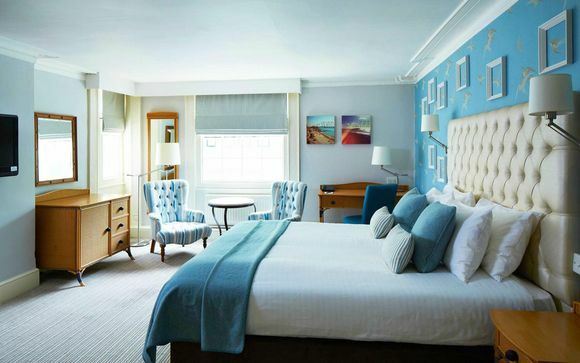 Wake up to calming views of the famous Brighton promenade when you choose to stay in this room. Just for you: dinner with a bottle of wine on the first night. Stay two nights and receive afternoon tea on the 2nd day. In a superb setting, relax and enjoy a range of international and classic cuisine, complemented by a wide selection of wines from the hotel cellar. With large windows affording wonderful views of the promenade, the hotel's newly refurbished Steak-on-Sea restaurant is the place to enjoy dinner. This is where the hotel's chefs serve only the best and freshest ingredients and menus change seasonally. For less formal dining, guests are welcome to eat in the Steak-on-Sea bar, which serves light meals and snacks throughout the day. There is also the option to dine al fresco on the terrace during the warmer months for the restaurant and bar. The afternoon teas are also very popular – especially for celebrations with a difference – so why not add a glass of Champagne or sparkling wine to accompany your finger sandwiches and enticing range of cakes and pastries? Exclusively available to guests at The Old Ship Hotel, this resident-only gym is a fantastic place to work out. With facilities such as treadmill, rowing machine, upright bikes and more, this on-site gym is located on the lower ground floor and offers a vibrant atmosphere for an energising spot of exercise. From the M25 – Exit junction 7 onto the M23 South which follows onto the A23. Follow signs to Brighton and on reaching the town, follow signs for the seafront. After the Royal Pavilion (on your right), turn right at the seafront roundabout onto Kings Road (A259). You’ll find the hotel 600 yards on the right. From the South West – Follow the A30 to Honiton and join the A35. Bypass Dorchester and after 6 miles turn onto the A31. After 32 miles continue onto M27 and then A27 to Brighton. Follow signs for the seafront, turning right after the Royal Pavilion (on your right) onto Kings Road (A259). You’ll find the hotel 600 yards on the right.